Highly concentrated synthetic-based foaming agent additive for the production of concrete with lightweight aggregates such as polystyrene, expanded clay, perlite and vermiculite. -	rigid support on which they can be directly applied roof tiles, slabs, etc. 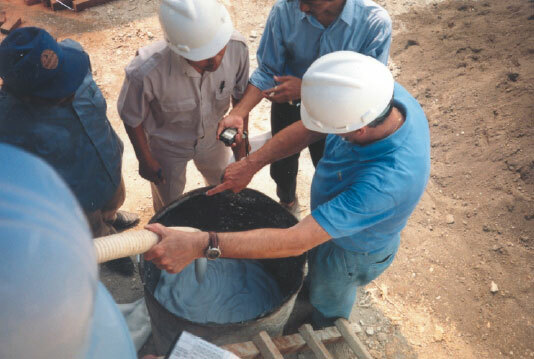 Load 90% of the total water in the concrete mixer +0.2-0.4 l/m3 of AGON CS®. Allow the concrete mixer to turn for 2-4 minutes at maximum speed. Load the lightweight aggregate in the quantity per m3 recommended by the manufacturer and mix in the concrete mixer for at least 1 minute after the aggregate has been completely loaded at maximum speed. Load the prescribed quantity of Portland R.325 or R.425 cement (and the sand) for the job. Load the remaining 10% of water in the concrete mixer and mix for at least 4 minutes at maximum speed. If a concrete mixer lorry is used for long-distance deliveries, turn the mixer for 3-6 minutes before unloading. If unloading is interrupted for a number of minutes, before restarting the unloading procedure, turn the concrete mixer for 3-6 minutes at maximum speed to ensure that any burst foam will reform. The products are produced with the best row materials available on the market in order to obtain a high quality product. Our guarantee covers the quality of the product but not its applications which cannot be under our control.